I learned how to make delicious Irish desserts because they are a fundamental part of the Irish cuisine just as in most countries. Desserts and other dishes are made with the many great products grown and produced in the country. Because of the large production of beer, whiskey and liqueurs in Ireland, these products are commonly used in the cooking of desserts and other dishes. These alcohols helped to preserve desserts like unbaked fruit cake before ovens were added to the kitchens for baking. Ireland has grown a variety of apples for thousands of years and is known for having a rich tradition in orchard growing. It is obvious to see why so many have learned how to make the Irish desserts with apples. These recipes would be dumplings, cakes, crumble and many more. In some of these similar recipes, you might find being made with pears, strawberries, cherries, rhubarb or other locally grown fruits. Don’t think the massively grown Irish potatoes are left only to stew entrees, side dishes, or Irish appetizer recipes. This popular vegetable is found in many other recipes as I found when I learned how to make Irish desserts. Potatoes are commonly found in candy; mashed potatoes make a delicious moist center for chocolate dipped candy. You will find either grated or mashed potatoes in recipes for sweet breads, cookies, cakes and other Irish desserts. We do not want to overlook the other locally produced products which offer flavor and texture to Irish desserts. The Irish butter is like none other; the flavor of this butter adds great flavor when cooking or baking cookies and cakes. Fresh milks and creams help to whip up the Irish potato recipes; the heavy whipping cream adds to hundreds of dessert recipes. In a saucepan, combine the 1 ½ cups sugar, ½ teaspoon cinnamon, ½ teaspoon nutmeg and water. Bring to a boil; reduce heat and simmer for 5 minutes. Stir in the butter and set aside.Combine the flour, baking powder and salt. Cut in the shortening until it is coarse crumbs. Add milk and stir until all is moistened. Mix well and separate dough into 6 pieces. Roll each piece out big enough to wrap around each apple. Mix together remaining 1/3 cup sugar, ½ teaspoon cinnamon and ½ teaspoon nutmeg and pecans. Set a prepared apple in the center of each piece of rolled dough. Sprinkle with the sugar mixture and dot with additional butter. Moisten edges of dough with water and wrap around apple, pinching edges to seal. Place apples in a 9x13 inch lightly greased baking pan and pour syrup over the apples. Bake for 45 minutes or until apples are tender. Combine butter, 1 tablespoon sugar and orange peel in a small mixing bowl. 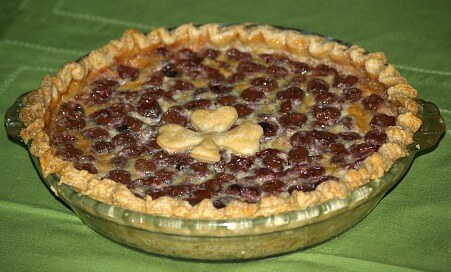 Add 1 cup flour and mix until dough forms; press onto bottom and sides of well greased 9 inch pie pan; pinch around top. Combine ½ cup sugar and ¼ cup flour with rhubarb; place mixture in pastry lined pan; bake for 10 minutes and remove from oven. Decrease temperature to 350F degrees; mix CREAM CHEESE FILLING and pour over rhubarb. Bake at 350F degrees for 30 to 35 minutes; mix TOPPING and spread over cheese filling. Chill for several hours until cold before serving. Combine cream cheese and sugar; beat until fluffy. Add egg and mix well until creamy. Combine 1 tablespoon flour and 2 tablespoons sugar; sprinkle over unbaked crust. 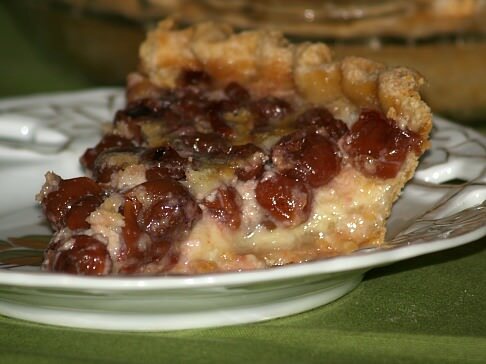 Spread drained cherries in crust. Combine beaten yolks, 1 cup sugar, milk, 2 tablespoons flour and melted butter. Mix well and pour over cherries; bake 50 to 60 minutes or until center is set. Serve cold topped with whipped cream.